e wrote about this yesterday and the day before that. It continues to escalate and blow up in ISO’s face like bubblegum. First of all, get a load of this ISO leak from WikiLeaks (alluded to before). An internal document of the International Standards Organization (ISO) that found its way late last week on to the Wikileaks whistle-blower platform raises further questions about the choice of a fast-track certification for Microsoft’s OOXML document format. The paper, by Joint Technical Committee No. 1 (JTC 1) of the Geneva standards organization, which dates back to July 2007, says the fast track procedure chosen for certifying Microsoft’s document format is only intended for the acceptance of unaltered standards and that a standard not accepted in its original form, while not to be regarded as “2nd class” or illegitimate, should be put through the normal five-stage standardisation process, should necessary corrections be identified in advance. The fast-track process, it says, is intended for making changes to an original draft. As you can see, Mr Bryden says it is irrelevant, trying to argue that the appeal is about something else. It looks like Mr Bryden don’t want to read the JTC1 directives. Mr Bryden is just lobbying for the honor of its institution, and I really doubt the judges who will decide about the rules are really neutral either. Watch the comments attached to this. This seems like quite a fiasco, but most of the world is apathetic because the press won’t present the situation properly, if at all. I fully support Andy’s conclusions and the opinions of the process that he expresses in his article. While that process is not finished and though many, including the four appealing countries, have pointed how just how deeply flawed it is, the powers at be seem unwilling to admit that anything out the ordinary or inappropriate happened here. That’s a real shame, because it does not demonstrate to the world that these organizations are necessarily the right venues for IT (ICT) standardizations in 2008 and beyond. As OOXML continues to move to being no more than a footnote in the history of IT standardization, I hope that ISO and IEC will ultimately stand up, admit that there were clear flaws here, fix the process quickly, and avoid fading into the background for those looking to create and use first class open IT standards in the twenty-first century. Stephane rips it apart totally, also based on technical grounds. It’s been 3 months since ISO made that April 1st gag when they declared OOXML a valid candidate for an “open standard”, even though it’s riddled with patents. Microsoft made the situation even more ridiculous by making available, after April 1st, documents that are absolutely necessary in order to fully implement their file formats. Well, if those documents were not part of the ISO proposal in the first place, then what is the ISO proposal good for? Isn’t an “open standard” meant to be implemented by more than one vendor? Completely, utterly, shamelessly, ridiculous. Typical Microsoft. Let’s get on with the ridicule. Remember the days before April 1st? A day could not pass without a number of so-called independent companies claiming support for OOXML in one way or another, and telling how good it was. Well, since April 1st, it’s like not a single freaking person cares about it. Silence. How so? Wasn’t it a fraud to begin with? How is this project going on? Let’s see for yourself on this web page. The project is still a 1st revision source code dump, and it’s 4-month old. It’s hard not to laugh. Who thought Microsoft was serious when they started this project? Everyone worth his salt knows that a project like this involves an almost complete rewrite of both engines, and it could take a decade to do so. It’s ridiculous to think that a company or independent people would spend their lives essentially rewriting Microsoft Office code base (the non UI part). After all, isn’t it what was essentially done already with OpenOffice? Why isn’t Microsoft instead pledging support for the OpenOffice suite by helping implement the undocumented stuff? Alternatively, why don’t they instead open source their compatibility pack, a component that migrates Office documents back and forth? Earlier this month, Microsoft released another 5000+ pages of documentation. This additional documentation is a direct acknowledgement that what I have been saying on this blog was spot on, which is that the documentation that was made available earlier was just a fraction of what was needed to implement a full run-time of Office documents. At least Microsoft gives way to a so-called anti-Microsoft person. 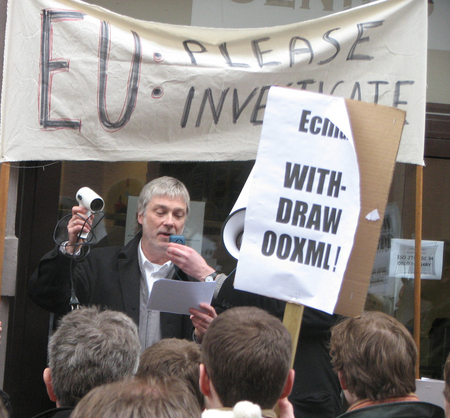 The status code for the ISO’s publication of OXML as an international standard has been on hold since four countries appealed the outcome of a ballot resolution meeting. That roadblock may now be lifted as soon as next month. This short article happens to quote the man who took a trip to Redmond and then became “a new man” [1, 2, 3, 4, 5, 6, 7]. It is worth just a quick reminder. We recently wrote about Microsoft's mass-invitation. It was an invitation from a cheating "Elephant in the Room" — one among people who lack regard for ethics and rules. It’s about self-serving moves, a case of money mongering through fake affinity and half-hearted promises. Speaking of which, RedMonk is being paid by Microsoft now, according to this. Consider it a gentle warning. RedMonk an award-winning open source consultancy, which shows that Microsoft continues to stick its nose everywhere, including what it once daemonised and denounced as “communism”. With the 451 Group traveling to Redmond, this is something to watch out for. Don’t forget OpenLogic, Black Duck and other Microsoft-esque sources of influence deep inside the FOSS world (other than funding through advertising and sponsorships). This new ODF project from South Africa will hopefully steer clear off Microsoft’s attempt to influence everything, even Blender. This project builds a converter that allows conversion from the Open Document Format (ODF) to translation files (PO and XLIFF). Your statement that Brazil is indeed a P-member and that therefore its appeal should have been allowed is totally 100% incorrect. I see Brazil as P-member. So, it seems that Brazil is *not* a P-member of the JTC1 committee, but *is* a P-member of its SC34 subcommittee. I think you will agree to that, by consulting both lists. Confusing, but true. Then it comes down to which membership counts in determining whther an appeal is allowed. I’ll bet you will have to search for hours in the ISO rules for that one. But I’ll also bet dollars to doughnuts that the CEOs’ of the ISO and IEC know their own rules (or at least, have staff people to check them out). I’m told that there’s an update on this coming. Stay tuned.